The easyRESCUE is based on the AIS-system. AIS will use the channels 87 and 88. These channels are blocked in the normal FM radio, as there are data channels. It broadcasts on the frequency 161,975 Mhz and 162,025 Mhz. How long will the batteries of the easyRESCUE last? With an annual test, the batteries last 5 years and within this period, we ensure 96 hours air time from initiation of the easyRESCUE. 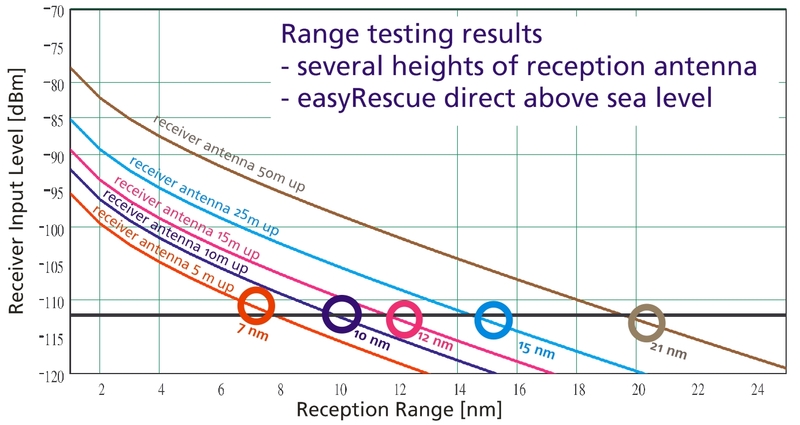 How far the signal of the easyRESCUE will be seen? How buoyant is the easyRESCUE? The easyRESCUE is fully amphibious. Like an iceberg, the transmitter and signal part out of the water tower, while the rest is under the water surface. How is the useability of the easyRESCUE? 1) How can it lead in? 2) How can it be turned off again? 3) Does it trigger automatically? 1) The easyRESCUE has a 2-stage trigger. First, a slide must be pushed through a breaking point. Then the activation by pressing the ON button. 2) By simultaneously pressing the buttons ON and TEST for 3 seconds. 3) No, there is no automatical trigger. The easyRESCUE has to be lead in personally. All plotters or pc’s which are equipped with an AIS-receiver will get the message from the easyRESCUE. Currently, an activated easyRESCUE appears as a ship icon with a reference AIS SART active. Does my plotter or PC receive data from the easyRESCUE? Each plotter, which can receive and display AIS data, can also receive and display data from the easyRESCUE. Does The device get its own MMSI? No, the unit is factory shipped with a manufacturer’s Unit-ID. Does this MMSI must be reported to the Federal Network Agency? Yes, the unit must be notified, but not be allowed. to make the functionality of the easyRESCUE even safer and more effective. How does a database an electronical device become safer? Not the device itself is safer, but dealing in the emergency order. By specifying this data, you allow first responders such as official DGzRS act effectively and quickly in an emergency can. For example: Go overboard and turn on the easyRESCUE. Now, any vessel in the area, which is equipped with AIS, see your “live position” and take part in the rescue. Deposited by the radio identification of your vessel in the database is now as follows possible scenario: A ship in the vicinity receive your activated easyRESCUE. By radio now, this special ID to the DGzRS or the Coast Guard continue to be given. With this ID, and only thus, get the “official agencies” insight into the database and can anfunken your “mother ship” inform and. If you are in your accident near the coast or within reach of an official lifeboat, your easyRESCUE ID is detected and compared directly with the database. Now if it were to be a rescue mission of these institutions through which stored data can also special features such as Allergies, spec. Diseases or the like are taken into account. Which data will be requested? Yes, the data is secure. Of course, no one gets access to your stored data. Only in an emergency, it is the official bodies by the identification of your activated easyRESCUE possible to consult the relevant emergency. Without activated ID is not possible. Each easyRESCUE is a personal and very individual code in, you can log in with you and your data about change, and of course can delete it. How do I mount the holding plate? How do I mount the belt holder? How do I mount the neoprene bag? Where do I mount the neoprene bag? How does the automatic release work? If there is a contact between antenna and left screw of backside of easyRESCUE-A for more than 2 seconds it will activate! And of course if you press the ON-Button on the front. How does the automatic activation works? We measure the electrical resistance between antenna axis and left screw where you fix the backplate. Is it zero for longer than one second the device will activate. My easyRescue/easyONE is not seen by my own boat via AIS nor DSC (easyRESCUE-PRO), what is wrong? 1. Your plotter or its software is too old. An AIS SART or MOB transmits on the worldwide known AIS frequencies (161.975 & 162.025 MHz) with a defined MMSI number starting with 970 (AIS S.A.R.T., easyRESCUE) or 972 (AIS MOB, easyONE). It uses the message 1 for position update (there are 27 used messages within the AIS system) and 14. Message 14 is the SRM (Safety Related Message). Within this there is the Navigational status: 15 is transmitted within Test-Mode by pressing the “TEST”-Button, 14 is for an active alarm by activating the unit. Maybe your chart plotter is too old to show you the symbol of an “S.A.R.T.”. This is a red circle with a cross inside. Please have a look at your ship list. Here you should see a MMSI number starting with 970 / 972. If yes, please try to contact the manufacturer of your plotter if there is an available update. 2. Your receiver could be overloaded. But what´s this? Let us explain it in a different way. Somebody is screaming to you near your ears. So you are not able to understand him. In this case the “ear” is the receiver and the noise comes from the transmitter. This means if you are to near to each other you cannot understand it by overloading. If you go to a farer distance maybe >20 meters the receiver is able to understand the signal again. In another way you also can twist the antenna around the transmitters housing to attenuade the radiated transmitting power. So you reduce the chance of overloading. For the trials the easyRESCUE / easyONE also needs a GPS signal. So please go outside on deck or maybe the gangplank. If somebody is falling into the water it takes round about 4-5 seconds to open the automatic life vest and to pull the person above the waterline. Until the emergency transmitter has got the GPS fix it also can take 35 seconds up to 2min. Within very bad weather conditions and environment it also can take up to 5minutes. all receivers can get this. So you don´t have to be worried about that “overloading”.